Thanksgiving is over and in a day or so, November will be completely behind us. Staring us right in the face is a month that many of us love to let loose in. Days off of work, celebration with family, various holiday parties and lots of food and drink make this month so dangerous that once it is over you hear the same resolution mantras year after year once December exits and January enters. Sound familiar? I don’t mean to sound like a scrooge at all. I will most definitely attend my share of holiday parties. In fact as I look at my calendar, I am very thankful for the multiple “ugly sweater parties” I will be attending and the various work gatherings I have on the calendar. At the same time however, I also cringe because I know that at all these events there will be a lot of food, alcohol and of course dessert that will be calling my name and without undoubtedly, I will answer that call! With all of that said, I have accepted December for the health trap that it is. However, I did something a few years ago that I have repeated each December and I highly recommend to everyone. As I mentioned above, folks wake up on January 1, some hungover and others not, and realize “damn, I was bad in December”. The pants fit tight, the scale annoys them because of the number they see and the resolutions begin. But why do people wait til January 1? Don’t Wait Until January 1! Three years ago, the gym that I am currently a member of, Lifetime Fitness, opened up the location that I go to in Garden City. They opened their doors in the first week of December. When my family joined, I thought that maybe we should just wait til January because were we really going to go to a new gym in December? Boy was I wrong! Since then, when everyone is making ” “January 1” their eureka moment, I would much rather stay ahead of the pack and pick December 1. Think about it for a second, would you rather wait until January once you have added 5, 10 or whatever number of pounds to your frame and work harder to take that off? Or is it easier instead to offset the gains as they come along? Don’t get me wrong, December will be bad, but by all means embrace the holidays! I know I will. By starting an exercise routine in December however, you will give yourself the opportunity to either gain very few pounds or if you are lucky, none at all! Simple logic also tells you that once the deadly month of December is over, it’s easier to lose a few pounds if you started working out in the beginning of December than to lose a lot of them if you wait until January. An added benefit of starting a healthy plan in December is that there is no one in the gym in comparison to January. It’s a given that EVERYONE will show up to the gym in that first week of January. December tends to be a ghost town in the gyms! 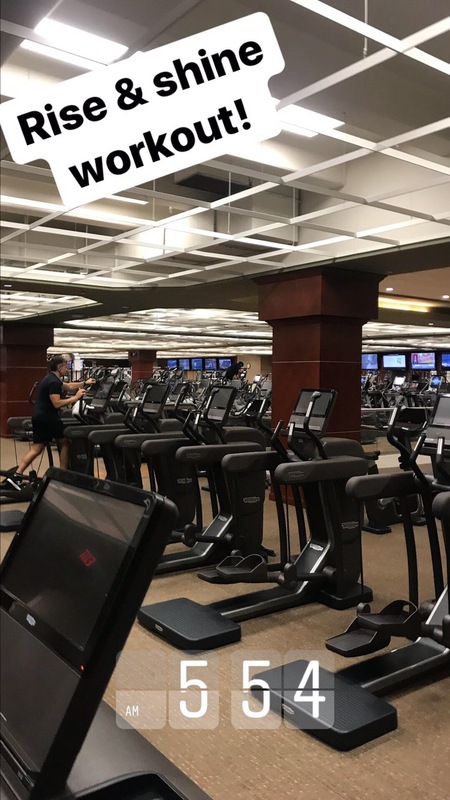 Get Ahead Of The Pack – Gyms Are Empty in December! There is no rule that “New Year’s Resolutions” need to start on January 1. I know your schedule may look busy in December but I encourage you to find those gaps in your schedule. Trust me they exist. Further, I have always said that you do not need a block of two or three hors to get a workout in. Remember, some time spent on yourself is better than no time.! Once again, get ahead of the pack and start now, believe me you will not regret it! The 2017 installment of the New York City marathon has come and gone. I must say that there were so many great emotions for me personally during the last week because of the marathon and I didn’t even run the race! From the race week activities, to just visiting the finish line and to hearing the stories of so many friends that ran the race, it has been a great week to just take it all in. When the race finally began, I decided to “watch” the race for the final time hopefully in some years to come. I literally say on my couch from about 9am until 2pm which is when channel 7 ended their coverage. I was engulfed by all of the stories coming across the broadcast. One of the ones that really got me emotional was the story of Beverly Ramos, an outstanding female runner from Puerto Rico, who completed her marathon training in Puerto Rico after the wrath of hurricanes Irma & Maria had left the island in shambles. With the suffering that her country was enduring, Beverly pushed on and was determined to run the marathon. Her interviews on the broadcast were pretty emotional. She may not have finished as well as she would have wanted but she came to New York, competed, and is likely going home to Puerto Rico a champion. Then there was the story of Meb Keflezighi. Most of you probably know it. The storied American marathoner is calling it quits after this race. For a while, he teased us all a bit during the marathon as he ran with the lead pack and he may have even taken the lead once or twice. Nevertheless, the 42 year old marathon legend would finish in 11th place in his 11th NYC Marathon. Adding more suspense was that he collapsed right after the finish line. He was fine, just exhausted from giving the marathon that he loves so much, all that he had left in his body. 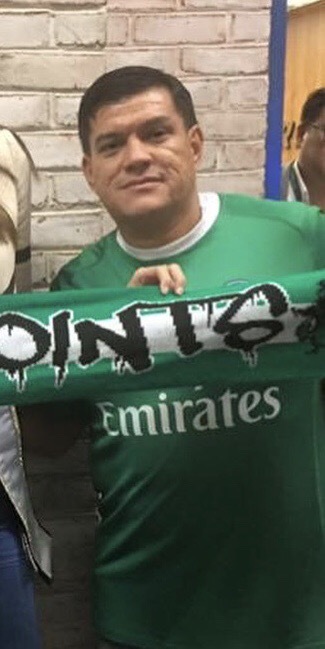 He will be missed on the NYC marathon scene, at least by me. 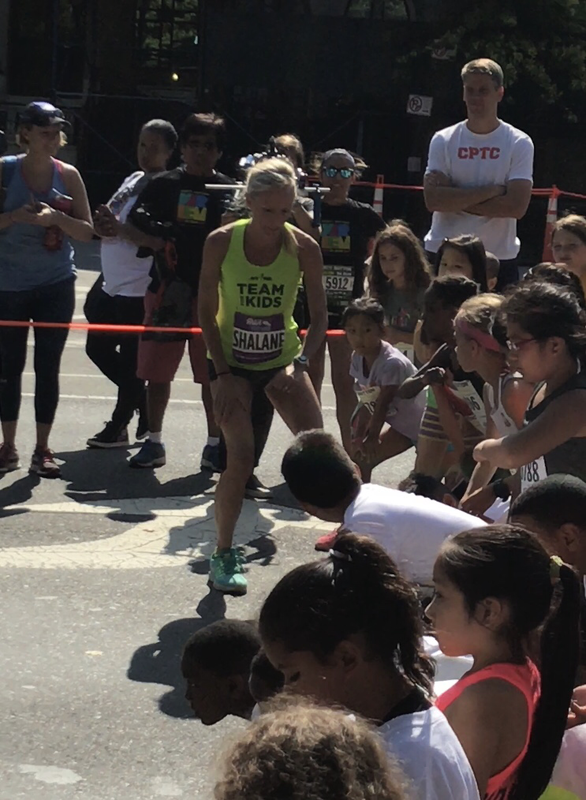 Shalane Flanagan talking to children before the start of NYRR Percy Sutton Kids race in August. Then of course there was Shalane Flanagan. Oh how she has lifted so many young girls spirits. Being a youth amabasador for New York Road Runners club, Shalane was a favorite for alot of kids on Sunday, including my 7 year old daughter who got to meet her back in the Percy Sutton 5k in Harlem back in August (see my pic above from that day!). Shalane was at the starting line for the kids races that day high fiving all of the kids before they sprinted to the finish line. Fast forward back to Sunday’s marathon, watching her with my daughter from the couch was pretty awesome as she broke the tape to become the first woman in 40 years to win the New York City Marathon. Hoisting the American flag with a huge smile on her face was not only a much needed proud moment for Americans but INSPIRATION for so many young girls. Then there was the fun aspect for me to track some celebrities from my couch with the New York Road Runners app. I got a kick out of watching Kevin Hart go out at sub 3:30 pace only to see him cramp up and finish in 4:05. I remember thinking “man Kevin Hart is going to CRUSH this”, but this is the marathon and it will test you! I also saw Tiki Barber and Prince Royce run a steady race and I am hoping that when I run the marathon in 2018, I can at least run faster than the three of them did! However none of these stories hit my heart and soul like the ones that ABC News 7 posted on their website earlier today. I ask you all to give this article a read and take some time to read the stories of the runners WHO NEVER GAVE UP. These aren’t experienced professional runners or folks in tip top shape. They came to this race wanting to finish. When water stations were empty and abandoned and when people no longer lined the course to cheer them, they continued. When nightfall fell they didn’t waiver. When their bodies told them “No mas”, their mind and their spirits told them to continue. Read these stories, they all finished the race! This is why running is SO POWERFUL and why it is my wish for all of you to experience the power of overcoming something you didn’t think you could do and being proud of it! Once you read these stories, if only one of you will get up and make a vow to make yourselves better, then my mission was accomplished for the day! Always believe in yourselves just like the 50,000 plus that crossed the finish line on Sunday did! 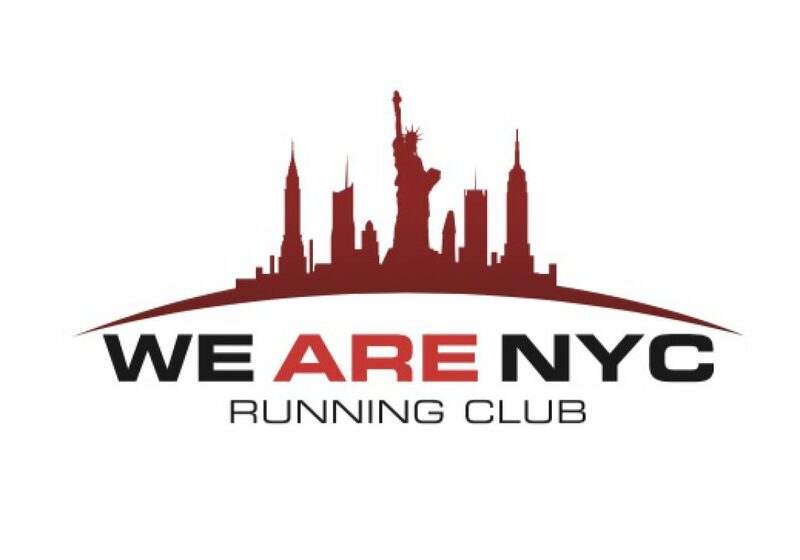 If your up to it, join me and let’s crush the 2018 NYC Marathon ir any other race together! I saw this quote today on my Instagram feed from a very motivational person that I follow, Audrey Puente from, Fox 5 here in New York. She posted this quote and ﻿it’s a question that I think many people should ask. I actually asked myself this question repeatedly when it came to the New York City Marathon. I always said “one day I want to run the marathon”. I said that for years! This past March I set up a plan for me to run it in 2018. Well actually New York Road Runners did. As of now, I’m qualified and slated to run the 2018 running of the marathon. I got tired of saying one day!! 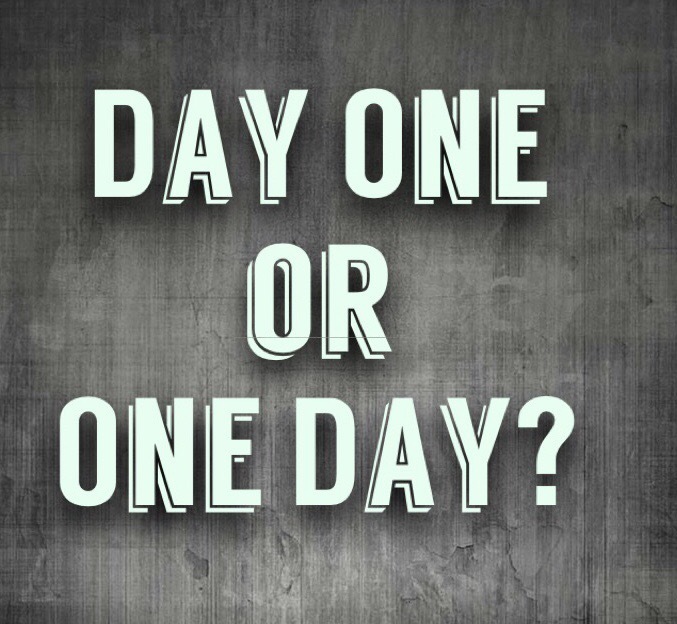 So which one will you choose- Day One or One Day? Enjoy the weekend my friends!! Never give in to the obstacles life throws at you! If you are just getting started in whatever type of training, there are going to be times when obstacles or roadblocks will challenge you. It might be in the form of a cramp, a nagging sore muscle, fatigue, a busy schedule or some unforeseen outside force. It is quite normal. Heck it even happens to the most veteran of people who have been working out. What is important to recognize however is how you are going to get past that hurdle and most importantly, ensure that it doesn’t beat you. Physical ailments may derail you temporarily but does that mean you shut down your workouts all together? For example, if you are a runner and you experience a sore muscle or a severe cramp in your leg, rest that muscle but perhaps cross train and keep the other parts of your body active. The key here is to try and remain as consistent as possible. Then there is the occasional thing that pops up on your schedule at last minute that keeps you from getting that workout completed that you had your heart set on. This happened to me on Tuesday night. Had my sights set on more strength training and a short run, however I had a friend stop by thay was doing me a favor and when he left, it was past 9pm. I thought about still going to the gym but that would have meant having dinner at 11pm which is not always wise. 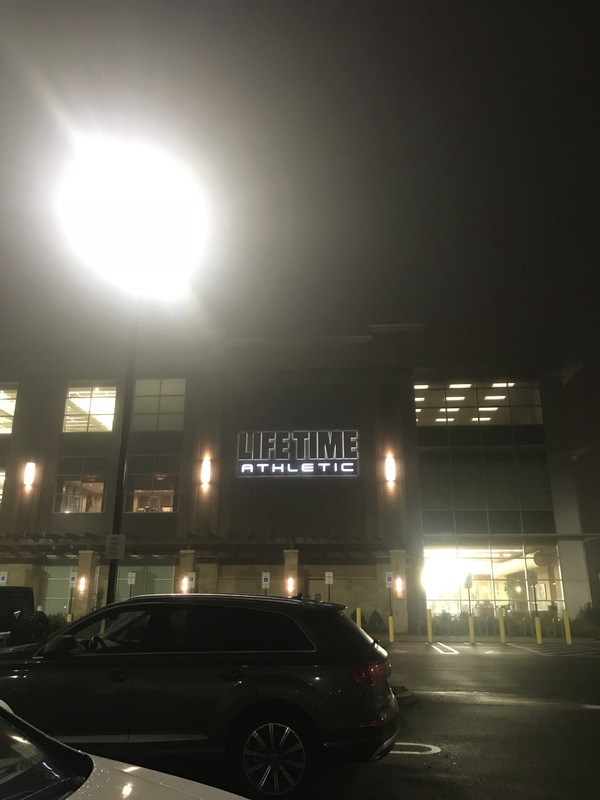 Walking into the gym in the early AM fog! Instead I altered my schedule, went to bed early last night and woke up at 5am today and got that workout completed. Now people will say 5am is too early. Yes it is lol – but the hardest part was waking up. Once that happened, everything flowed. Achieving your goals will take some sacrifice, there is no doubt about it. When my alarm went off at 5am, i thought about how I still had an hour and a half before I usually wake up. But to make up for my missed workout on Tuesday, that 90 minutes of sleep had to be sacrificed and in hindsight it was worth it! Early pic from my IG @cosmossoccerfan – Follow me! About the only thing I regret about this morning is because of the heavy fog out at 5am this morning, I was forced to run in the treadmill (grrr). My strength training was done with hardly anyone around me! Now off to work we go! Remember, don’t let those obstacles that life throws at you get in the way. It might take some sacrifice but find a way to jump right over them. Keep positive thoughts in mind like I did. I kept thinking about the breakfast I was going to crush! With that said – I’m done here and about to go and crush that omelette! Have a great day my friends! 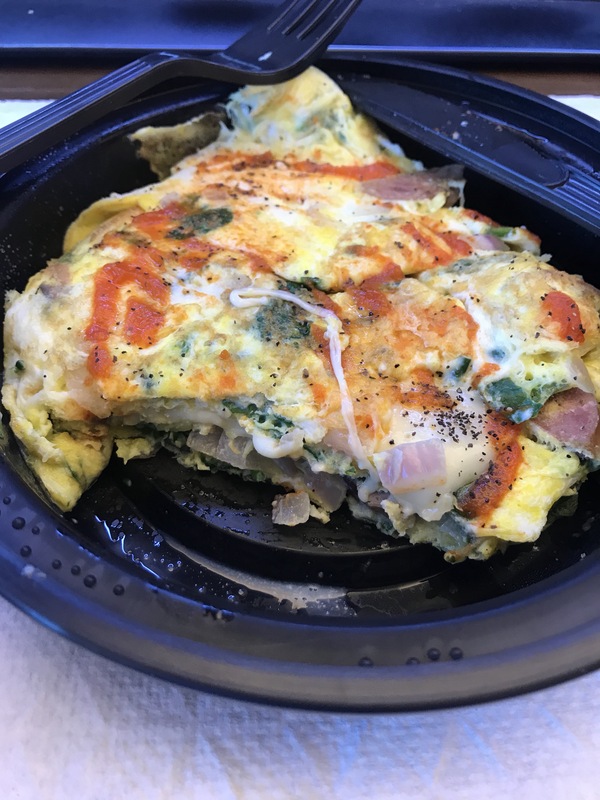 Protein after an AM workout – skip the potatoes& toast! Ok folks, I have a confession to make. I didn’t run this weekend, nor did I exercise either. I haven’t had a weekend like that in some time. Do I feel bad? Not really. A little guilty perhaps. But the calendar says it’s Monday and for me, that’s the time to get back on the fitness grind. If you commute to work, get off a stop earlier than you usually do and walk the rest of the way. Tomorrow do the same and perhaps add the return trip also. Drink coffee? Soda? Start to cut back the sugar. Sugar can pack on the pounds and if your trying to lose them, sugar will help. Look at your daily habits. Do you really need to binge watch all of those shows on Netflix on Hulu? Ask yourself how much time you spend daily on shows and start replacing that time with exercise. Walks, runs, trips to the gym. Anything is better than self-imposed Netflix marathons. Guilty of ordering take out? Don’t do it this week. Look over your diet and make healthier decisions. Add veggies to everything – breakfast, lunch, dinner and slowly cut out the carbs. It goes a long way – trust me! A lot of us have iphones – use the apple health app! Count your steps, track what you eat. It’s such a useful tool that is already on your phone but people don’t use it! Try it! Is Netflix your marathon? Consider scaling that back! 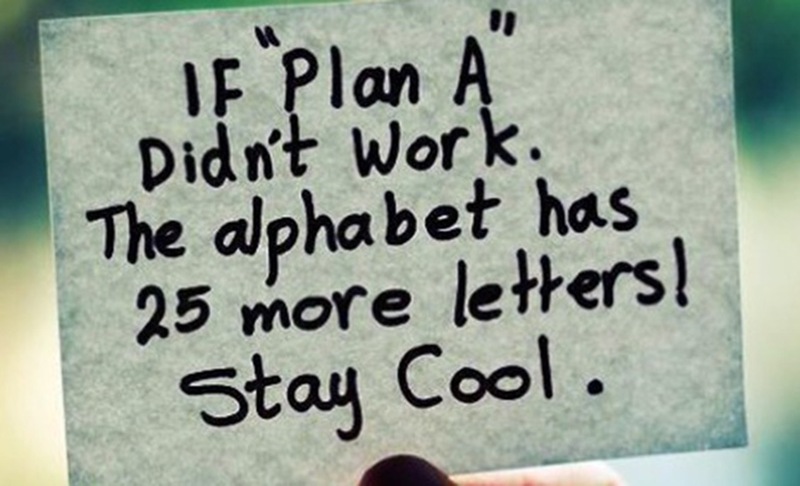 Of course, I highly recommend running to anyone looking for a longer term plan to feel better. My favorite recommendation for beginners, schedule yourself to take part in a 5k race in the next 3 months. That’s 3.1 miles. That gives you 3 months to get your body used to running 3.1 miles. Start out light. Jog a mile a few days a week for the first couple of weeks. 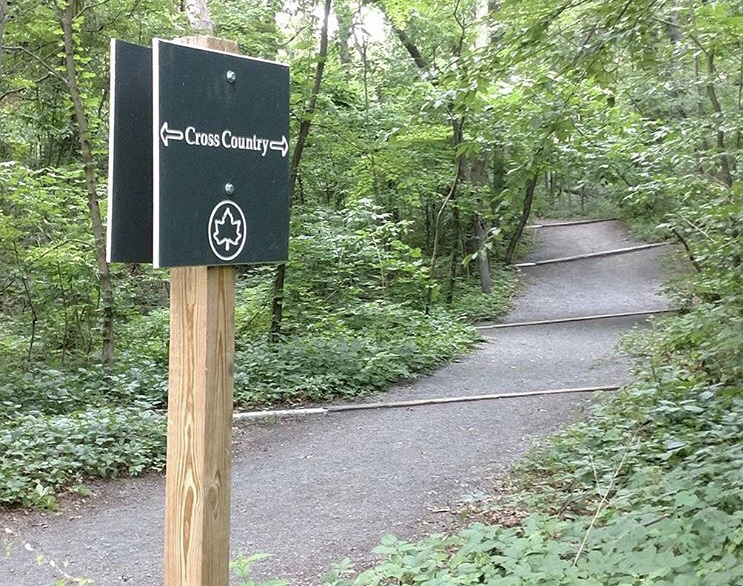 Then increase it to 1.5 miles and then gradually increase it each week. In your practices leading up to race day work up to running 4 miles max. If you can get two or three 4 mile runs in then a 5k on race day will be easy! But listen to your body and progress accordingly. If running is new to you make sure you stretch properly before and after and if you feel pain, not soreness, take a couple of days off before resuming. Monday’s should not be looked at as doom and gloom! It’s time to start a new routine! I gave you a couple of examples of how to start a new routine but ultimately its up to you to figure out what it is that you need to change! Just promise me one thing – that you will make today a better day than yesterday! Running doesn’t have to be fast – just consistent! Say no to the couch and yes to sweat! Ever since I ran the Staten Island Half-Marathon two Sundays ago, I have scaled back on my running. The training for that race put a lot of miles on my legs and with my next two races being a lot shorter, I decided to scale back a bit. In fact scaling back after a half marathon is highly recommended by the so called experts – see this article! This past Monday, I did some striders on grass to stretch out the legs a bit. On Tuesday, I ran some shorter distances on the track and focused on speed. Today the weather was too nice to not go for a run. The layoff from running long distances seemed to have helped as my pace overall was pretty swift. Here is the funny part though and the part that I think pertains to many folks reading this. I commute from Manhattan each day on the dreaded Long Island Railroad. Today I knocked out on the train ride home. I mean I was dreaming and the whole bit! Got home and felt like sleeping some more, but with the weather as beautiful as it was, I knew I wasn’t going to get too many more days like this to run during the week. So I pushed myself. I downed a Gatorade Endurance Carb Energy Drink and off I went. I highly recommend these if you are feeling sluggish before a workout! Got back at 7:30pm in time to enjoy some quality time with the family before everyone is off to bed. Once they knocked out, I logged on here about a half hour ago to write this. Why am I telling you my day? Because I want you all to see that even though our days can be busy and you may feel bogged down by it all – you can still get that work out in! You don’t need that much time – I gave it an hour today but a half hour would have been more than enough. I always say – “a little workout is still better than no workout“! I’ll be posting my workouts from time to time. If you start to workout too, share yours with me! Would love to see your progress! That 4th mile was under 8:00 because I waited at a traffc light for like 30 seconds during that mile – argghhh!! Maybe its time for your first step? As I mentioned in a previous post, I got back into running about 4 years ago. It has led me on quite a journey learning about myself and as long as my legs will allow me to keep running pain free, I don’t think this journey will end. But where is it going? Well to know that, I’ll have to tell you where I’ve been first! I ran cross country and track & field in HS and had some pretty good success with it. Managed to get down to a 2:02 half mile and a 5:05 mile. I would say that is ok.
After high school, I continued to run in college and even shortly after college but primarily to stay in shape. Even though I did run after high school, my intensity level was a lot less than it was in high school! Years went by and as family life settled in and daily routines as a homeowner and father of two arose, the pounds started to pile on and the waistline started to expand. If I ran 3 times a year I was probably exaggerating. Then in 2012 I got a phone call from a friend who I ran cross country with in high school. He had become the alumni director in my high school and was reaching out to some of his running buddies to get a group of alumni runners to run an alumni race at the school’s varsity cross country city championships. I couldn’t pass up seeing old friends and running the course I used to run at Van Cortlandt Park in the Bronx, so you know I said yes and showed up. In high school, I ran the 2.5 mile (4k) course in high school usually under 15 minutes. On that day I ran the alumni race and out of 120 alumni, I finished 118th in the race and it might as well have been 119th because me and a buddy ran together and we finished together. My time was 23 minutes and change! Now let me stop for a second and say time should never be an issue to a new runner. But when you used to do this week in and week out and see where you are now, it’s an eye opener! I felt helpless on some of those hills while I was running and woke up the next day in insane amounts of pain. In the following months, I let that day scar me for a while for really no reason. Weight piled on after that and I developed some nagging pains in my ankle that a foot doctor said were weight related. I peaked out at close to 200 pounds. Peaking at 200 pounds in 2013 – boy was that bad! I love my family but when your daily routine consists of work, home, eating, drinking, lounging around the house and sleeping, it’s time for a change. My doctor prescribed me orthopedic inserts. At a very slow pace, I started to run again regularly. I changed my diet and in the course of a year my weight started to drop. In that year, I would come home and spend time with my family but I would yearn for a run. Sometimes when I would have a bad day at work, and even to this day, I tell my family, “Look, I’m not in a good place right now, can you give me an hour?”. Off I would go for a run and I would come back a changed person emotionally and mentally. For the past four years my need for a run has been like a drug but of course this is a good drug! I blame the euphoria that I mentioned in my last post and the endorphins that running brings. How many of you out there feel tired all of the time. How often do you settle for nights on the couch which follow another night of takeout food? Weekends come and go and no exercise was done. Do you miss how you looked in high school or college? Are the clothes getting tight? Or do you wake up hungover way too many mornings? Running worked for me – it can work for you! Start that change – all it takes is for you to get up and take the first step! 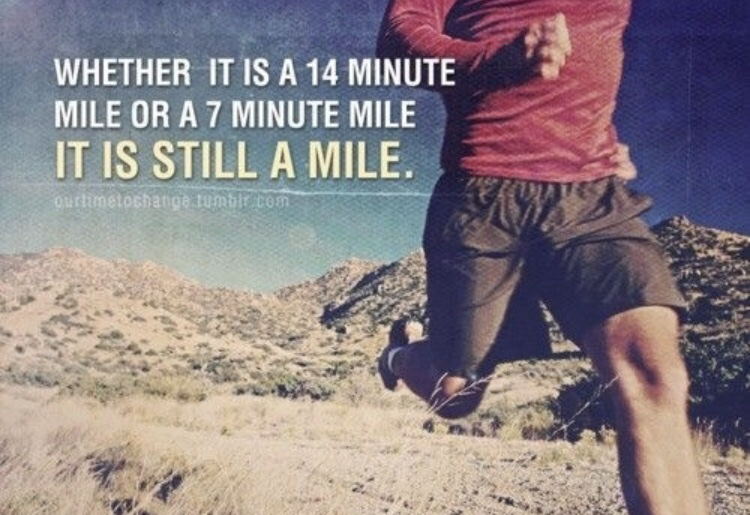 Get out and run, one step at a time!